When I was playing in Los Angeles a few years ago I remember a jazz saxophonist telling me that rockabilly was too simple, it usually only had three chords. Then he listened to more of it and agreed with me that yes it has three chords but the feel and groove of how you play those three chords is not nearly as simple as it may seem. 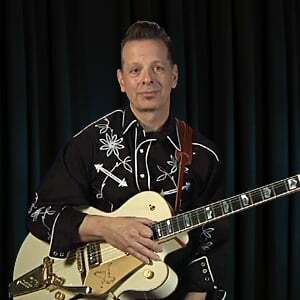 Rockabilly comes from a time in which music had a big swing feel which was necessary for the dancers who wished to "dance to the bop", and has a kind of hillbilly approach to playing swing that gives it its own special rhythm. Let's try this in the key of E over standard 12-bar blues changes. I have two basic rhythms to get started with. This one is an arpeggio style and the other in the following lesson is single 8th notes on low strings.